Right since childhood, the world in which we live teaches us to bury our bad past somewhere deep inside us and just move on. So deep, that even we can’t possibly dig it back out. What happens when a 10 year old child, who claims to be your future son, comes to you to help you find his mother, who’s your perfect match? What happens when you eventually start doubting his intentions? What happens when a girl starts turning your dreams into nightmares? What happens when your future son starts haunting you? What happens when your future starts bleeding into your present through your PAST? Hey Dad! Meet My Mom!!! is nothing less than a roller coaster ride of mystery, love, comedy, fear and suspense. So make sure you don’t forget to expect the unexpected!! 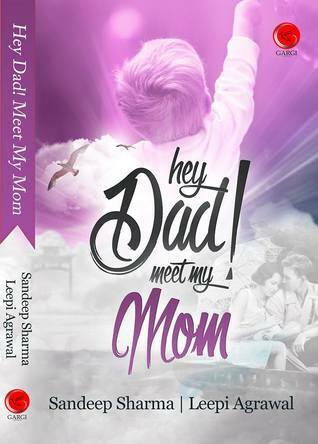 REVIEW: "HEY DAD! MEET MY MOM" the title of the book, first thing you see in any book, brings attention of the readers. Book Cover also suits the story and Blurb gives you hint about the book that it contains the time travel, but this book is not a love-romance story. As the blurb says, 'Expect the unexpected" this books is beautifully unexpected story. Book starts with the mystery and questions which forces the readers to turn the page. Every chapter consist of poetic verses which relates with the story. Some of the poetic verses touch your heart. The theme of the book is mind blowing for narration. Book is humorous throughout the story and binds the readers.In the end it reveals the secrets one by one and undoubtedly as a reader, you'll cherish this story for long.